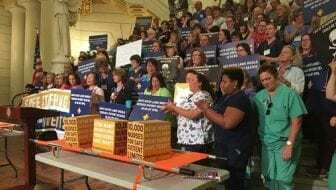 HARRISBURG, PA (WSKG) – More than 100 scrubs-clad nurses filled the Capitol rotunda Tuesday in an effort to convince lawmakers they’re overworked, and the state needs to do something about it. They brought with them more than 10,000 signatures from around the state supporting legislation that would create minimum nurse-to-patient ratios. The two bills–identical ones in the House and Senate–are currently stalled in their respective chambers’ Health Committees. The nurses delivered the 10,000 signatures to the committee chairs, Luzerne County Senator Lisa Baker and Crawford County Representative Kathy Rapp, both Republicans who have so far stayed noncommittal on the issue. Supporters of nurse-to-patient ratios say there is evidence they would keep more people healthy. They often cite a 2010 study that concluded if Pennsylvania had mandated ratios when California did, it would have had around 10 fewer annual surgical deaths within two years. However, the nurses marching on Harrisburg are in conflict with the Pennsylvania Nurses Association, which largely represents their interests on the state level. Association CEO Betsey Snook said while the group wholeheartedly believes hospitals across the state do have a staffing problem, they don’t support mandatory ratios because, in part, they’re not flexible enough. Instead, the group supports a proposal to create committees that would involve more nurses in staffing decisions. Pamela Nimsick, an RN in Williamsport, said she resents the Nurses Association not supporting ratios. Asked if the association’s stance has anything to do with state hospitals’ lack of support for ratios or other staffing mandates, Snook is blunt. A spokesman for the Hospital and Healthsystem Association of Pennsylvania confirmed, they don’t think Pennsylvania’s hospitals have a staffing problem. Nimsic said she and other nurses just know what they’ve seen at work: people are burned out. So far, around fifty legislators and Governor Tom Wolf have said they support mandatory nurse-patient ratios. But the bills that would put them in place aren’t considered particularly high-profile and may not see much movement when lawmakers return for their whirlwind fall voting days before the end of the session.